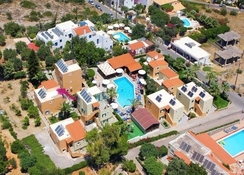 The Sunrise Apartments Hersonissos is family-friendly hotel located in Koutouloufari, Hersonissos in Greece. The nearest beach is 800m away from the hotel complex. Guests can take a refreshing dip in the outdoor swimming pool on its premises that serves as excellent spot for the guest to indulge in leisurely recreational activity. All the 30 studios and apartments set amidst the beautiful gardens. All the apartments and studios are tastefully decorated and equipped with all essential modern-day amenities. The hotel complex houses a restaurant and a bar that serve a wide range of delicacies from local Greek and international cuisines along with local wines, beers, signature cocktails, alcoholic and non-alcoholic beverages. The hotel’s location, proximity to the beach and town of Koutouloufari, makes it an ideal destination for vacationers looking for a sunny and culture rich holiday in Greece. The Sunrise Apartments Hersonissos is located 26.4km away from the Heraklion International Airport and 103km away from the Sitia Public Airport. The town of Koutouloufari is 400m away and the Hersonissos is 4.1km away from the hotel complex. Major landmarks like the Lixnostatis Folk Museum, Aquaworld Aquarium, Acqua Plus Waterpark, Labyrinth Park, The Crete Golf Club, Malia Strip, Dinosauria Park, Cretaquarium Thalassocosmos, Watercity and Nikos Kazantzakis Museum are located within a distance range of 18km from the hotel. On special requests, the hotel can arrange for rental cars for their guests’ local excursions. Airport pick-up and drop-off can also be arranged by the hotel management. 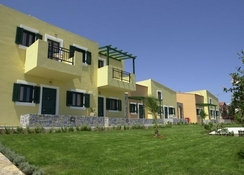 The Sunrise Apartments Hersonissos has 30 studios and apartments set amidst the beautiful gardens. All the apartments and studios are tastefully decorated and equipped with all essential modern-day amenities to make the guests’ stay a comfortable experience. 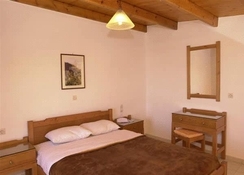 All the studios and rooms are equipped with all the modern-day amenities like television with satellite channels, radio, bathroom with shower, bed linens, upholstery, bath linens, essential toiletries. All the rooms have fully equipped kitchenettes, patio or a balcony, offering either a sea view, garden view or the pool view. 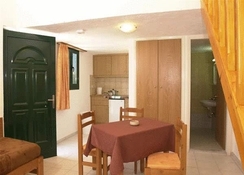 The Sunrise Apartments Hersonissos houses a restaurant that offers a special breakfast menu consisting of varied range of dishes from local Greek and numerous international cuisines. The in-house bar offers local wines, beers, signature cocktails, alcoholic and non-alcoholic beverages. The guests can also try out restaurants, bars and traditional taverns at the local beach and the town of Koutouloufari. The Sunrise Apartments Hersonissos houses a beautiful outdoor pool that serves as an excellent spot for recreational activities like mild pool games and refreshing dips. The hotel also houses a billiards table, where the guests can indulge in friendly matches. Interested guests can also try out water sports that are offered at the nearby beach. One can also hire rental car and indulge in sightseeing at the nearby towns.